Although there was a global economic crisis, there were still many female stars obtaining the sponsorship of branded outfits. Joey Yung, Myolie Wu and Ivana Wong got the sponsorship of Fendi. Charlene Choi had Sonia Rykiel to sponsor the crystal mini-skirt, while Kay Tse had the sponsorship from Plein Sud for her nightgown. Hins Cheung's outfit was sponsored by Dior Homme. This rumored couple, Myolie Wu and Bosco Wong, were competing for the newcomer award category together for this year. Usually, both of them would avoid each other and refused to have a photograph together. But last night, both of them were standing together. At least they became one of the focuses among all the other singers. Every year when the singers are gathered at the music award ceremonies, there will be quite a number of rumored couples meeting each other inevitably! 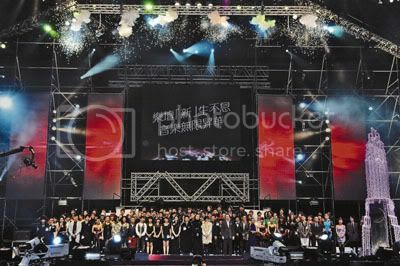 This year, Bosco Wong and Myolie Wu, whom are TV artistes-turned-singers, were standing together without any avoidance when taking the group photo. Bosco even could not help but smile widely. It was unknown if he was smiling because he had an award, or it was because Myolie was by his side? Huh? Why were they 'ordered' to stand together? 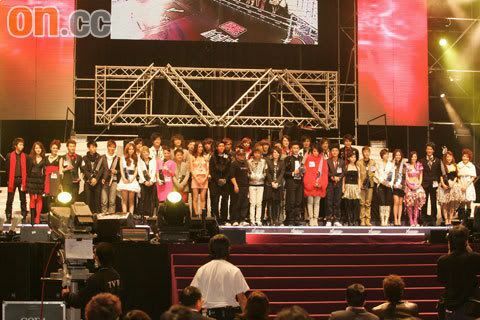 I guess the standing position of the singers had already been arranged by the organizer beforehand? Thanks for sharing the news!! :D i'm back from my hols! a late Merry Christmas to all friends here! :D and an early HAPPY NEW YEAR!! !